Forward head posture is the most common form of improper posture responsible for neck and shoulder pain in many individuals. The head weighs nearly the same as a bowling ball. When the head is placed in a further forward position than normal, it adds an increasingly greater force on the neck, much like when you hold a bowling ball away from you, it’s more difficult to hold it. The supplementary force from a forward head posture adds even more stress on the cervical spine and increases the demands on the surrounding muscles which function to hold the head upright. Imagine the effects of the increased and sustained efforts from these muscles on the rest of your body. The improper posture can often cause restrictions in blood flow that cause a decrease of oxygen and energy delivery which can impede waste removal. The neck ultimately suffers, causing stiffness as well as trigger points that attribute to the well-known symptoms of head and neck pain along with discomfort on other parts of the body. The increased tightness resulting from forward head postures can contribute to nerve compression as numerous nerves pass through the surrounding muscles. 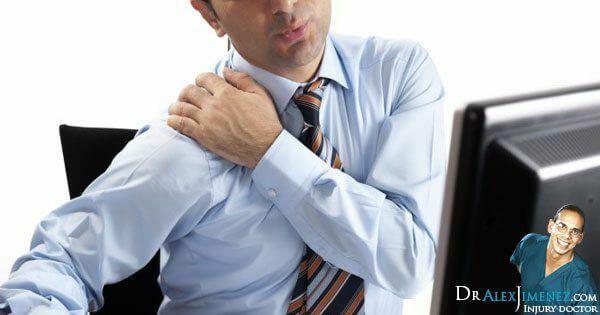 Because these specific nerves also run down into the arm, any type of neck complication can cause pain, tingling, and numbness on the shoulder, elbow, wrist, and fingers. Furthermore, rounded shoulders from an improper posture can create a variety of shoulder complications. As the shoulder blades move forward, they restraint the space the rotator cuff tendons have between two of the bones found in the shoulder. The space restriction can lead to compression of the cuff tendons, occasionally causing tears. Additionally, space is also greatly limited between the clavicle and the first rib which in turn can close down on important nerves and blood vessels, eventually causing radiating pain and numbness all the way down into the fingers. Over time, improper posture can also debilitate back and shoulder muscles because these are constantly being stretched, causing them to lose their capacity to keep the shoulder joints in movement without experiencing pain. The two most important components for correcting forward head posture and rounded shoulders begin with you. Postural awareness and frequent correction can greatly help an individual start to improve their posture. Stretches and exercises can also play the important function of postural correction. Strengthening exercises can help restore the original flexibility of the muscles in order for the body to progressively and naturally regain the strength the muscles need to pull you neck, shoulders, and back into a proper posture while decreasing and even preventing any unwanted symptoms of pain and discomfort. A majority of individuals frequently seek medical attention after experiencing constant pain and discomfort on their neck and shoulders, including repetitive headaches. While injury is believed to be one of the leading causes for cervical spine complications among the population, there’s another important and often overlooked factor that may be contributing to the individual’s gradual symptom development; posture. For more information, please feel free to ask Dr. Jimenez or contact us at (915) 850-0900.